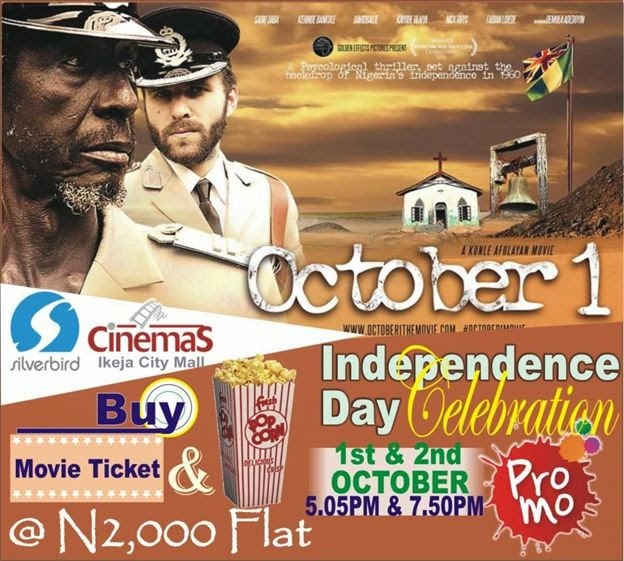 The long-awaited Nollywood movie, October 1 hits the cinemas tomorrow, Wednesday 1st of October 2014. The Kunle Afolayan movie will be screening at the Genesis Deluxe Cinemas, The Palms, Lekki; Silverbird Cinemas and Ozone Cinemas on Wednesday 1st & Thursday 2nd October respectively. It’s September 1960, and with Nigeria on the verge of independence from British colonial rule, a Northern Nigerian Police Detective, Dan Waziri, is urgently dispatched by the Colonial Government to the trading post town of Akote in the Western Region of Nigeria to solve a series of female murders that have struck horror in the hearts and minds of the local community. On getting to Akote, more murders are committed, and with local tension high and volatile, Waziri has a race on his hands to solve the case before even more local women are killed. Set against the backdrop of the national celebratory mood of the impending independence, Waziri is pulled into a game of cat and mouse as he and the killer try to outwit each other…leading to the climatic end in which the life of a popular local female teacher and village belle, Tawa, is held in the balance. Waziri has to race against the clock to capture the killer, save Tawa and solve the crime before the British flag is lowered and the Nigerian flag raised on Independence Day… October 1st.